“While creating the Arctic Circle in early 2013, I remember telling my friends that in the previous year I had attended eight Arctic conferences as the President of Iceland. In the United States, Russia, Finland, Brussels, Norway and all over. And I thought to myself - it can’t go on like this. No one has the time to criss-cross the world, even if only for practical reasons. So I told my friends that we needed to create for the Arctic what I call a Medieval square. A platform in the essence of the old Medieval square where anyone could come knowing that they would meet anybody and everybody there,” says Iceland’s former president, Mr. Ólafur Ragnar Grímsson. We meet in Harpa, the Music & Conference Hall on Reykjavík’s waterfront that recently hosted the sixth successful Arctic Circle Assembly, which has become the largest annual international gathering on the Arctic. The Assembly is attended by stakeholders representing a wide range of Arctic interests; international, national and regional policymakers, scientists, indigenous representatives, business people, academics and many more. Attendance has steadily grown and this year the Assembly exceeded all previous numbers in participation, sessions, topics and speakers. When Mr. Grímsson speaks of the Arctic Circle he does so with pride and it is evident that his vision and ambition were big from the beginning. But did he expect it to become this big, this soon? This year over 2000 people from 60 countries attended the three day long Arctic Circle Assembly. Close to 170 sessions were held and speakers numbered some 700. The two days prior were packed with pre-events, meetings and forums in Reykjavik and this year there was even a post-event for the first time. Years have passed since Mr. Grímsson first spoke about a new model for Arctic cooperation. That was in a keynote speech he gave at an Arctic Celebration of the University of Lapland in Rovaniemi, Finland 1999, emphasizing the need to bring politicians, scientists and regional leaders together. Following that he took part in creating the Northern Research Forum, which held conferences in different parts of the Arctic for a number of years and to which he largely credits his interest and knowledge of Arctic matters. “The Northern Research Forum gave me, together with other Arctic conferences I attended, both an experience and knowledge of people and issues that were very valuable when it came to the creation of the Arctic Circle,” says Mr. Grímsson. “One was the growing importance of the Arctic which has changed Iceland's position as well as the world's. The second was the growing challenge of climate change which would result in not only the melting of our own glaciers in Iceland but in neighbouring countries like Greenland and the melting Arctic sea ice which would create major problems for every nation in the world. Then, the third was the growing importance of clean energy, especially geothermal where Iceland had a success model which could be relevant to the world. Interestingly all these three strands are related. They form a coherent triangle, the Arctic, climate change and the clean energy. Because without the global clean energy transformation the future of the Arctic will be very dangerous and the ice will continue to melt,” says Mr. Grímsson. 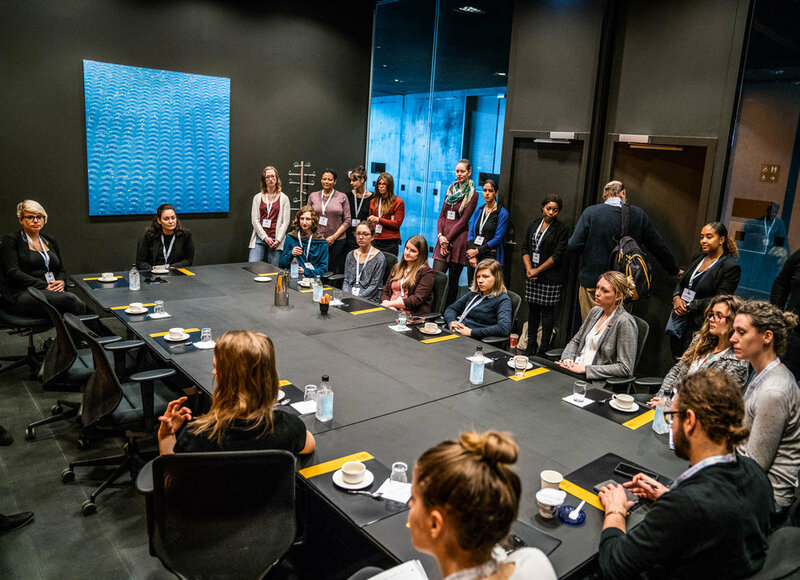 “Another part of the structure, equally important, was that I wanted the Arctic Circle to be a platform where different organizations and partners came together and held sessions in their own name. With full authority over both the sessions and the agenda of the speakers,” says Mr. Grímsson. He credits this part of the structure, largely for the wide diversity in topics discussed at every Arctic Circle Assembly. Is that why the Arctic Circle Assembly never has a theme? “Absolutely, and that was also deliberate,” says Mr. Grímsson. “Every year we are asked by foreign diplomats, by various organization and others: What is this year’s theme? When we say there is no theme, people are surprised. Of course there is a certain thinking that goes into electing speakers for the plenary sessions and choosing certain individuals rather than others. To that extent you can say there is a tendency in the way the Arctic Circle brings forward a certain view. There is a systematic thinking that goes into the program, but it is an open process. So when we get requests, whether important individuals or others can participate we take each one very seriously. 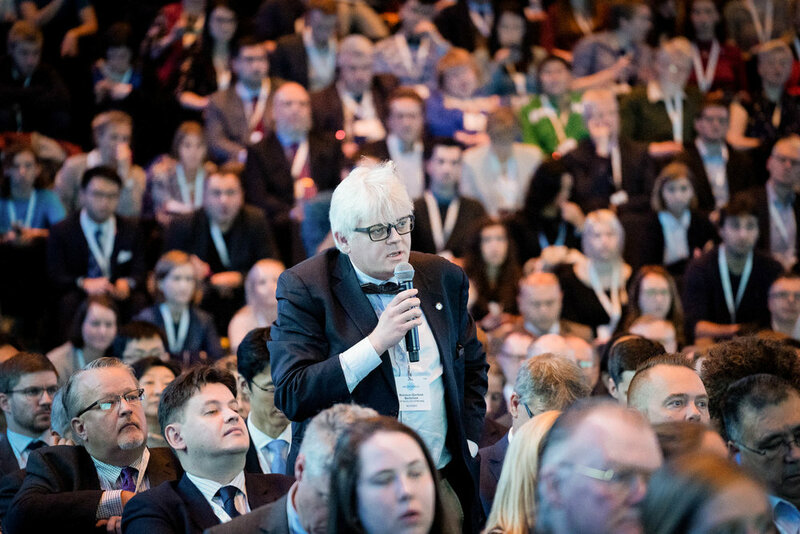 Over 2000 speakers have stood on Arctic Circle stages, at the annual Assemblies in Reykjavik and at the Forums in Greenland, Scotland, Alaska, Quebec, The Faroe Islands, Singapore and Washington. Below are some memorable speeches and discussions the author has listened to at past events. 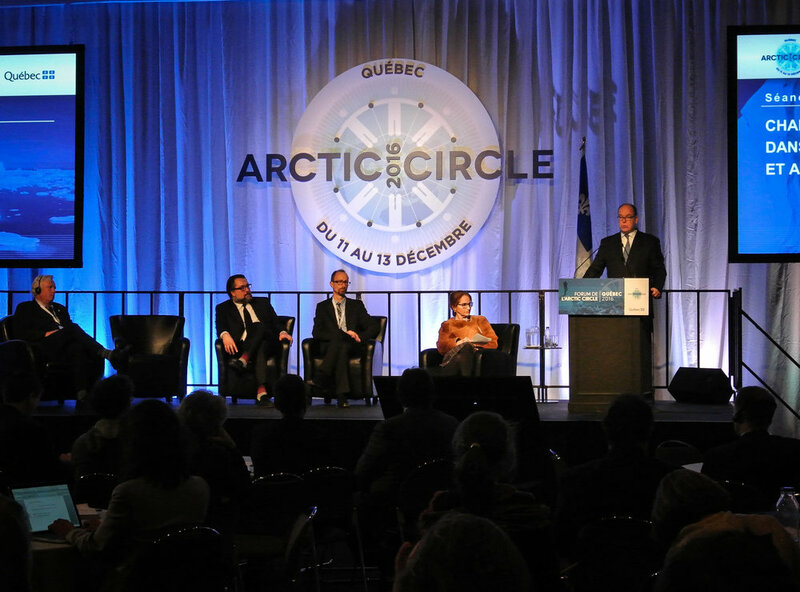 President of France, Francois Hollande addressed the Arctic Circle Assembly prior to the Paris Meeting in 2015. He spoke about the impact of Climate change as he witnessed first hand traveling to different countries and during his visit in Iceland. “It should upset us all how little we know about such a large part of our planet.” Google’s CEO, Eric Schmidt in a discussion moderated by publisher Alice Rogoff, on the challenges of mapping the Arctic Ocean floor. Arctic Circle Assembly 2013. “We do not have time on our side.” Sir David King, former Special UK Representative for Climate Change, explaining the three most critically important parts of the Paris agreement. Arctic Circle Assembly 2018. Canadian politician, Cathy Towtongie’s eye-opening speech on Arctic economics at the Greenland Forum in 2016. Describing how the prevailing authority that exists in the Inuit mind clashes with the institutionalism of authorities and what Royalty Resource Sharing means for Inuit Canada. Member countries of the Arctic Council are Canada, Denmark, Finland, Iceland, Norway, Russia, Sweden and the United States. The countries from outside the Arctic region that Mr. Grimsson refers to have used the Arctic Circle Assembly extensively. Their presence and engagement has often been in the form of large Country Sessions fronted by highest level politicians and leaders from scientific institutions, research, academia, business and administration. Arctic strategies have been outlined, research innovation introduced and the social and environmental effects of climate change on their regions explained. Through the years Special Country Sessions have been held by France, the United Kingdom, Germany, Korea, China, Japan, Singapore, Poland, Italy, Switzerland, Finland and India. China, Korea and Japan have gone a step further and added a cultural flair to their presence by inviting all participants to celebrations with food, music and performances from their countries. “I view the Country Sessions and the growing involvement of countries outside of the Arctic region as a testimony to the truth of my analyses more than five years ago; that the Arctic was indeed becoming a global territory, important for major states as well as Arctic states and for the future of the planet,” says Mr. Grímsson. “Three years ago we added this interesting dimension, holding Arctic Circle Forums in other countries and thereby emphasizing the international structure of the Arctic. Sending out the message that the debate on the Arctic cannot only take place inside the Arctic. The Forums have been a success. Of course they are smaller in scale, 300 to 600 participants and more specialised in their agenda - but when you add them all up, the Forums in Washington, Quebec, Singapore, Scotland, Anchorage, the Faroe Islands and in Greenland we have another manifestation of the global transformation of the Arctic. Which I think quite frankly very few people, if any, five to ten years ago would have been able to predict,” says Mr. Grímsson. The next Arctic Circle Forums are in December 2018 in Seoul, Korea and in May 2019 in Shanghai, China. More are being planned and Mr. Grímsson says that there is a long list of countries and territories that have requested to hold Arctic Circle Forums. He adds that the same rules of engagement, that 21st century model, applies to the Forums no less than to the Assemblies. “This is in harmony with the major guiding principles that I built into the Arctic Circle structure in the beginning,” says Mr. Grímsson. “The first one was that everybody who attends is at the same level, regardless of background, agenda or title. Secondly anyone can ask questions in the plenary sessions. This was demonstrated very well when Ban Ki-Moon made his speech in 2016 and it was exclusively young people from different parts of the world who stood up and asked questions. The third way this is demonstrated is the importance we have given to the “sub-states” in the Arctic. There is no single name for it. They are called States in America, Provinces in Canada, Regions in Russia. We give them the same importance and the same scope to present their case and send their representatives as if they were major countries to like China, Korea, Britain and Russia. “It is interesting to speak about this now,” Mr. Grímsson adds. “As Emmanuel Macron, the President of France will soon host a meeting in Paris exactly on this challenge. How to create a new 21st century model of effective international cooperation. Because the formal institutions are no longer working. We saw that in the G7 meeting in Canada. It just ended in chaos. We also see parallels at the United Nations in many areas. 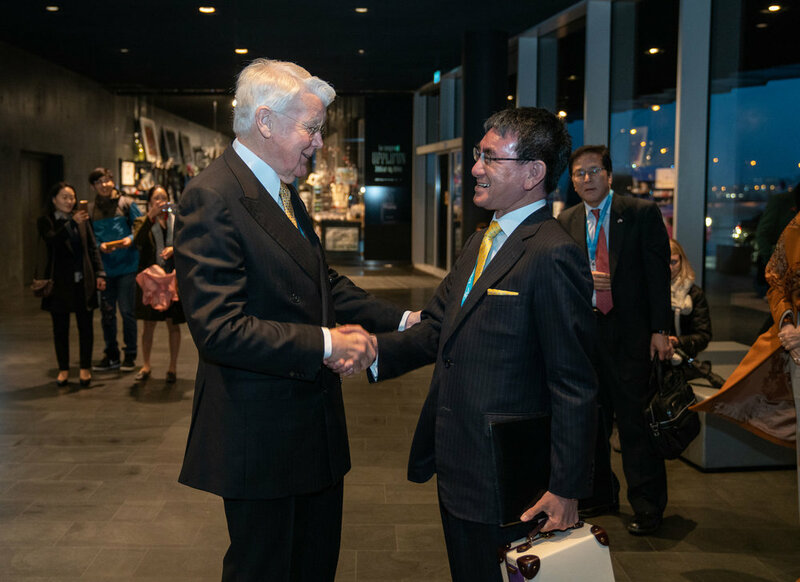 Mr. Grimsson strongly believes that the even importance given to regional as well as national stakeholders in the Arctic has transformed visions within these regional territories. “Few people may realise it, but over 90% of the Arctic landmass is under federal structure. Not officially, as Denmark does not classify itself as federal state, but I would classify the Kingdom of Denmark with the constitution and position of Greenland and the Faroe Islands within the Kingdom being in fact a federal state more than anything else. If one looks at the composition of Denmark and compares it to Canada and the US it is actually quite similar,” he explains. “So, at every Assembly you will find important sessions organized by these Arctic and sub-arctic territories under federal structure and we are seeing clearly the effect that work has within these territories. For example the State of Maine in the US which 5 years ago did not have any Arctic policy or Arctic strategy has now realized that they are a major player in the new transport and communication matters of the Arctic region. Therefore the Governor has attended the Assembly and in the last three, four years we have seen large delegations here from Maine,” says Mr. Grímsson. He mentions Scotland as another such strong example. “The First Minister has participated in and addressed the Arctic Circle Assembly twice. Before she came here first in 2016 the Scottish government had not paid much attention to what was happening north of Scotland. Now they are formulating an Arctic Strategy for Scotland, which will be executed irrespective of whether Scotland becomes independent or stays a part of the United Kingdom. Scotland also hosted an Arctic Circle Forum in 2017 where they showed how strong their interest and work towards the north has become. Discussing the Paris agreement, Mr. Grímsson mentions two speeches that in his mind sealed the importance of the Arctic Circle as the platform for open discussions on the future of our planet; President Hollande’s speech a few weeks prior to the 2015 Paris meeting and Ban Ki Moon’s speech a year later, delivering a message on the success and implications of the Paris agreement. Which brings us to the issue of Arctic politics. “The political importance of the Arctic is growing for a number of reasons. First of all we have eight Arctic states governing the territory according to international law. Two of these are major powers, the United States and Russia. We also have all the dominant economic powers in Asia taking an active interest in the Arctic as do the leading continental European countries like France and Germany,” says Mr. Grímsson. “Climate change matters to God,” said His All-Holiness Ecumencial Patriarch Bartholomew I, when giving a strong keynote speech at the Arctic Circle Assembly in 2017. “If we are going to open the Arctic to commerce and shipping we must also be prepared to deal with environmental issues in a responsible way,” said Guggenheim’s Global Chief Investment Officer Scott Minerd at the 2018 Assembly, reminding governments and stakeholders of Eleanor Roosevelt’s words: Tomorrow is now. “Even though activities in the Arctic have increased I do not yet see benefits for the communities I represent.” Okalik Eegeesiak, speaking at the Assembly in 2016 as the Chairman of the Inuit Circumpolar Council. US Senator of Alaska, Lisa Murkowsky discussing the vast difference between the Two Arctics in the Assembly’s 2014 opening session, following an introduction on the Alaskan view of the Arctic by publisher Alice Rogoff. Nicola Sturgeon, First Minister of Scotland and Olafur Ragnar Grímsson during an open dialogue with the audience following her first keynote speech at the 2016 Arctic Circle Assembly. The First Minister addressed the Assembly again in 2017. Aleqa Hammond, then Premier of Greenland discussed challenges of Climate change for her country at the opening session of the first Arctic Circle Assembly in 2013 - and had everyone’s attention when she turned to the issue of Greenland’s independence. Focusing on the role of leadership and perseverance, US Senator of Maine, Angus King gave an inspirational speech at the Arctic Circle Assembly in 2015, during a session on U.S. Leadership in the Arctic. As always, the dates of Arctic Circle Assemblies are announced three years ahead. In 2019 the Assembly will be held October 11th-13th, in 2020 the dates are October 9th-11th and in 2021 the Arctic Circle Assembly dates are October 15t h-17th. Despite growing attendance and numbers of sessions and speakers, Mr. Grímsson says that there are no plans to add days to the Assembly. “We have a good, proven three day set-up that just works as it is. And we have this house which fits perfectly for the Assembly’s agenda and for the networking process which is an important part of the Arctic Circle. Where I expect to see expansion in the near future is participants, individuals, organizations, companies and of course policy makers and politicians, using the Arctic Circle Assembly as a meeting place for discussions and negotiations in private, connected or not connected to the Arctic. This has been a growing trend in past years and we have met the need partly by building temporary meeting rooms in a large open space on the ground floor of Harpa. They are free for all participants to use, people simply log into the Arctic Circle app and book a meeting room. The ten temporary meeting rooms built for the Assembly now were in demand throughout the three Assembly days,” says Mr. Grímsson.